In the aftermath of a hurricane, when emotions and devastation are high, roofers sweep through the Fort Pierce and Vero Beach areas to take on the jobs of repairing roofs. However, while there are dozens of legitimate, well-established companies stepping up to help, there are many others that are just coming in to scam people. This is unfortunate, and we at The Roof Authority want to help you learn to spot a scammer. The Roof Authority is a roof contractor serving the Fort Pierce, Vero Beach, and the surrounding areas. We have served Florida since 1993, and are licensed, insured, and bondable. When you need a roofer who can handle hurricane damage insurance claims, contact us today! 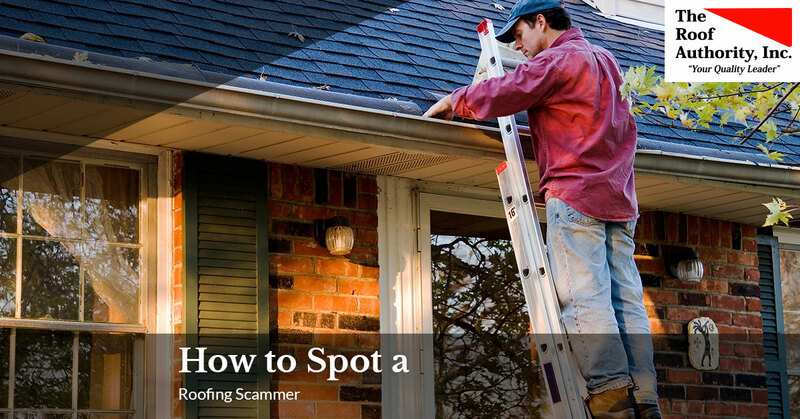 Ready to learn how to spot a roofing scammer? Even though this is going to take a few extra steps while the urgency is high, your diligence and attention to details will go a long way to preventing heartache down the road. No local address, or one that’s just a post office box, is a red flag. While some companies do have mailing addresses that are PO boxes, you need to secure the business front address. If they can’t give you one, there’s a chance they’re not legitimate. Not every company who goes door to door to solicit business is a scam. However, during this time of devastation after a hurricane, many fly-by-night operations will show up in droves with legitimate-looking flyers, business cards, and promises. When you’re at your wit’s end or the roof contractor in Fort Pierce you really want is booked out a few weeks, it’s easy to give in and say yes to the first available person. Don’t do it. Verify every claim and go through the steps we’ve outlined here before you do anything! No legitimate roofer will ask for cash up front to fund supplies and other expenses. Ever. Established companies have the money to buy those materials up front and will have payment plans that are contingent upon milestones being met. You will discuss payments over a timeline and have a contract to read over and sign. With an expense like roofing, and with something as important as the integrity of your home, you must get the terms of the work in writing. Don’t let anybody talk you into doing business on a handshake. Get the scope of the work, as well as deadlines, prices, and other terms in writing on a contract that both parties will sign. Always check the reviews of the roof contractor you go with. Check Angie’s List, Top Rated Local, Yelp, and other sites. Post on social media to ask friends for their recommendations as well. Word of mouth is huge, and if nobody has ever heard of a company, chances are, they could be a fly-by-night operation. Legitimate companies will be licensed through the state and will have insurance, workmans’ comp insurance, and be bondable. If you can’t get proof of these documents, don’t take chances. An injury that happens at your house could become your financial responsibility. Or the work won’t be up to code. It’s too risky! A hurricane is a terrible event, and one that, unfortunately, many Floridians are familiar with. However, taking a few minutes to breathe and do your homework will go a long way to preventing further financial tragedy. When you need a trusted roofing company who can handle hurricane damage insurance claims, contact The Roof Authority for a free estimate today!